Cedar and redwood trees are easily mixed up. While redwood trees are famous for how tall and wide they can become, they are also well known for their beauty and the strength of the lumber that is taken from their trunks. Cedar trees, meanwhile, are known for their fragrant wood and more closely resemble the types of firs used as Christmas trees. How Are Cedars and Redwoods Identified? Redwood trees and cedar trees are often mixed up with one another. Both have wood with a reddish tone, both are members of the same overall family and both have pine-tree-type features that may make them indistinguishable from one another. However, there are qualities that can make it easy to discern a redwood from a cedar tree. A good place to start is by learning how to identify a cedar tree. The cedar tree is coniferous. It has cones that grow on it that contain seeds for new trees. Cedar trees, unlike redwood trees, have a distinct odor possessed by no other tree in the forest. Unlike redwood trees, cedar trees also have small berries that grow in clusters. The berries are a bluish-green color and are generally not dangerous. Redwood trees, by contrast, have the same ruddy bark as a cedar tree, but they are not coniferous, they bear no berries and they lack the distinct smell of the cedar tree. However, redwood trees are remarkably tall, sturdy and strong trees. They have vertical lines on their bark and can grow only in very specific climates. Cedar trees are far less particular about their environment. In northern California are some of the oldest forests on the planet. This unusual climate with moist, humid weather is the ideal environment for sequoia trees to grow. Sequoia trees are some of the most fascinating and beautiful trees on earth. They can grow to more than 300 feet tall and weigh a tremendous amount. Sequoia trees can live for 3,000 years and are among the largest living organisms on the planet. They are coniferous trees and are dependent on the arid heat from the Sierra Nevada mountains to open up the cones that grow on the tree in order to release their seeds. They grow exclusively along the western slope of these mountains and need the drier temperatures provided by that particular altitude. Sequoias grow only in this one region of the world. These unique trees are instantly recognizable by their cinnamon red bark, thick trunks and heavy branches. Sequoia trees are the heaviest of the trees in this region. The largest recorded sequoia weighed in at 2.75 million pounds. Sequoia trees are part of the redwood family and are very often mixed up with redwood trees. What Are Giant Redwood Trees? The redwood trees that populate the forests of northern California are among the tallest in the entire world. While redwoods and sequoias are often considered interchangeable, the two trees are different although they are both members of the same family. Both the giant redwood and the giant sequoia are members of the Sequoia family. The giant redwood, also called the coastal redwood, is a species known as Sequoia sempevirens. Redwood trees thrive in the damp, moist and humid northern California air. The moisture in the air gets trapped in the soil by the famous northern California fog. This moisture that is prevented from evaporation by the cool temperatures in the region is what helps to sustain the redwood trees and is what allows them to grow to their remarkable, tremendous heights. These trees can grow to be up to 378 feet tall, with a tremendous branch spread. Giant redwoods can live for up to 2,000 years. Their branches can be as thick as 5 feet in diameter on a healthy tree. The bark, known for its cinnamon reddish-brown color, grows thick and dense on the trunk. The bark itself can grow up to 12 inches thick. This is remarkably thick but is still only one-third as thick as the bark of their cousin, the giant sequoia. What Are the Differences Between Redwood and Sequoia Leaves? While sequoia trees and redwood trees have a number of physical similarities that can make them difficult to tell apart, you can often tell which is which by looking at the leaves. Sequoia leaves are coarse and a dark-green color, and their growth pattern strongly resembles scales. They are similar to the cedar tree in their leaf pattern, although cedar leaves typically look flatter or more ironed down than sequoia leaves. In contrast, the redwood leaf has a lighter color and is flatter and longer. Similar in branch style, the tiny feather-like clusters that dot its branches look more like a hemlock tree than a sequoia. Being able to identify the leaves of a sequoia vs. a redwood is a good skill to have, particularly if you find yourself in a northern California forest and want to be able to tell which trees are which. 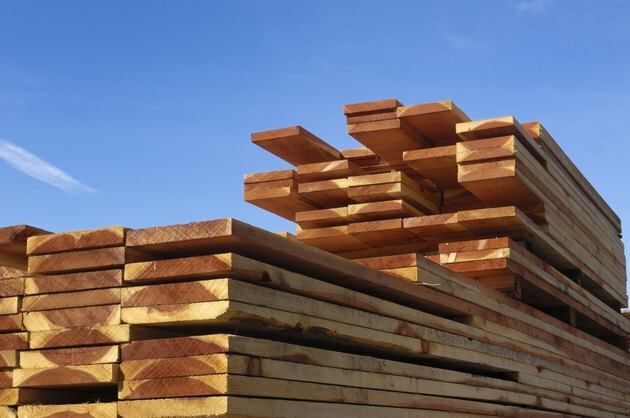 What Is the Difference Between Cedar and Redwood? Unlike sequoia trees, redwood trees have very strong wood, and their lumber has tremendous use. Some environmental scientists worry that the redwood's strength and durability are actually too good for the future of the species's survival. The wood is dense and tough and is popular for construction projects, from decks to closets to the exterior of houses. In addition to the redwood's strength and durability, the wood is resistant to rot from water and moisture and damage by insects. The wood's longevity and hardiness make it one of the costlier options for lumber. However, its durability makes it perfect for outdoor projects likes fences, sheds and home exteriors, particularly for structures built in a damp climate. These environments tend to have inclement weather and a proliferation of insects, so durable wood pays for itself in reliability. Cedar is another kind of wood well known for its popularity in closets, shelving, fencing and deck building. Similar to redwood in color and strength, cedar is also resistant to rot and repels insects due to a natural oil in its makeup. Cedar does not require an especially great deal of maintenance. If you are planning to use the wood as part of an outdoor project, you will likely want to sand and stain it, topping it with a sealant to prevent damage. Is Cedar or Redwood Better for Lumber? Many people choose cedar for indoor lumber projects, particularly for closets. Cedar is a classic closet material because it repels insects like moths that can be damaging to clothing, and it has a pleasant, soothing aroma that permeates clothes without being overpowering. Cedar is durable and cheaper than redwood and has a slightly yellowish, reddish tone that goes well with a lot of decor. Cedar is strong but not as strong as redwood, so redwood is often preferred for outdoor projects. Redwood, as its name suggests, has a reddish tone to its wood. Its natural oils give it strength and moisture and prevent insect erosion or infestation. Redwood is a popular material for fences and decks because, especially with staining and sealing, the wood can withstand inclement weather and temperatures without being destroyed. Redwood is more expensive than cedar, but that is because in general it will last longer and withstand more than cedar lumber will. How Fast Do Cedar Trees Grow?